The photos on this page were taken during a BirdLife Australia camp between 30 Dec 2013 and 4 Jan 2014. During the week we travelled to a number of locations, including Burrowa - Pine Mountain National Park in Victoria, Woomargama National Park in NSW, a private property along the Dora Dora (River) Road near Talmalmo, another near Walwa, various wetlands, and a wooded hill above a small cemetery in the Jingellic area. Our main focus was birds, but we also observed many other interesting wildlife species. Many thanks to the organisers of the camp, to the owners of the property where we stayed and also to the owners of the properties that we visited. Australian Pelicans at a wetland near the River Road to the west of Jingellic. 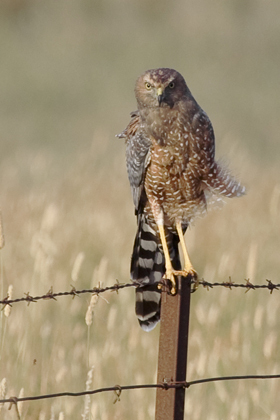 We were ever on the lookout for a Spotted Harrier, having seen one the previous year. 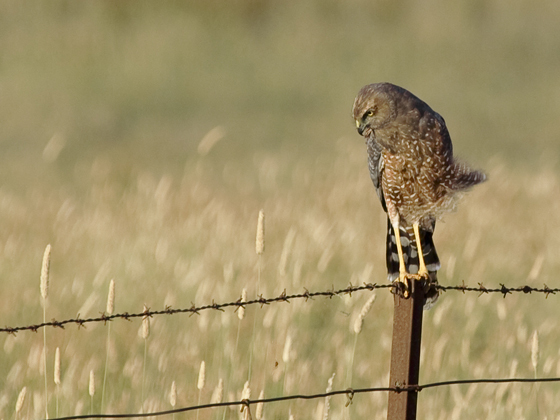 This bird sat obligingly on a fence near the road then flew off over our camp. are young. They had been constantly begging for food from the two adults. 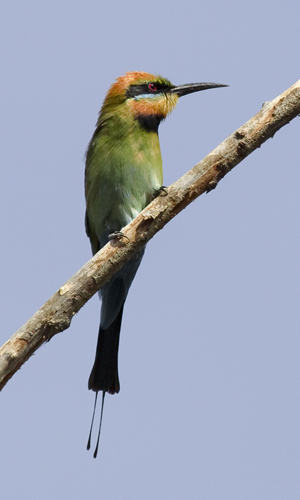 Rainbow Bee-eaters nested in the banks of the Murray River, close to our camp. 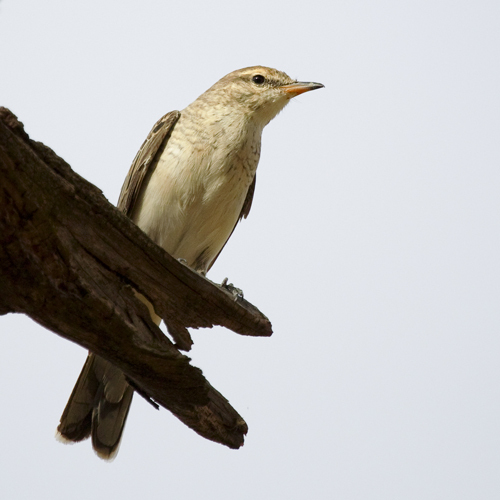 They frequently perched on exposed branches above the water. 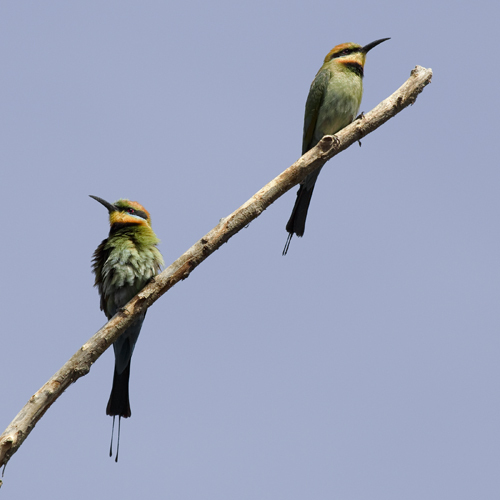 Above right: pair of Bee-eaters. The female is to the right of the male. 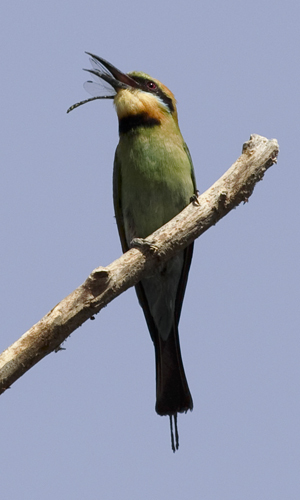 Right: female Bee-eater swallowing a dragon fly, wings and all. 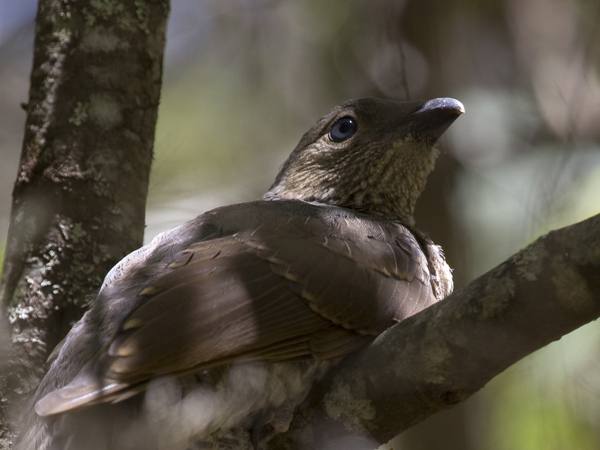 This immature Satin Bowerbird was seen in the Bluff Creek area of Burrowa - Pine Mountain National Park in Victoia. The park is to the south of Jingellic. 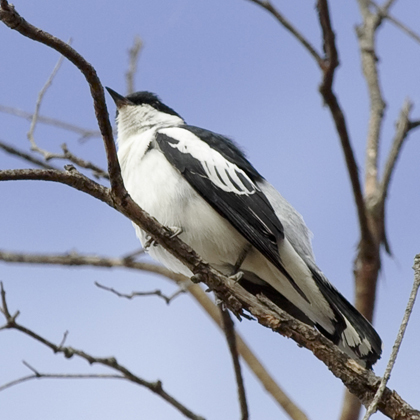 The song of White-throated Gerygones was a delight to hear around the camp and at a number of other locations in the Jingellic area. The best views some of us had of them was at a private property near Walwa, over the Murray in Victoria. 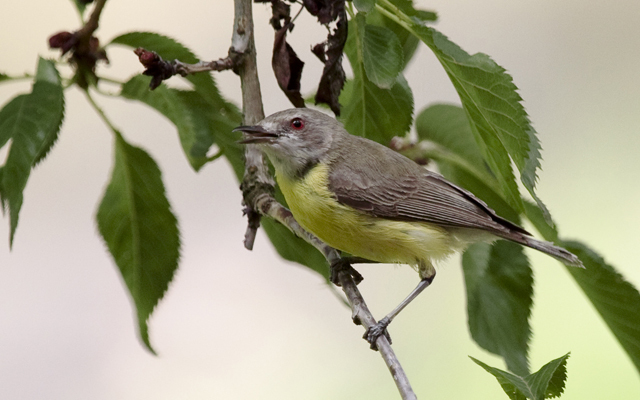 The bird at the right was in a weeping cherry tree outside the kitchen window of the house on the property. The owners kindly invited us in to watch and photograph the bird and its nest. 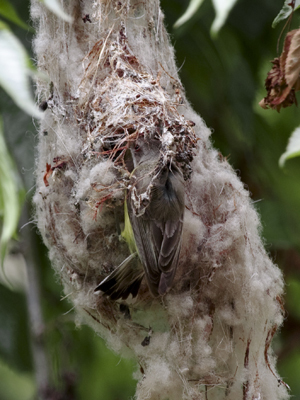 The image to the far right shows the above bird feeding young in its nest in the same tree. The nest is full of sheep wool. 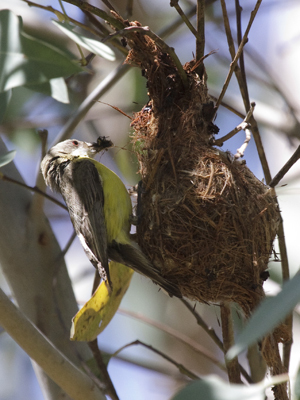 To the immediate right is a nest seen along the River Road west of Jingellic a year earlier. It is more natural in appearance and considerably smaller without any sheep wool. The parent is about to offer its young a large insect. 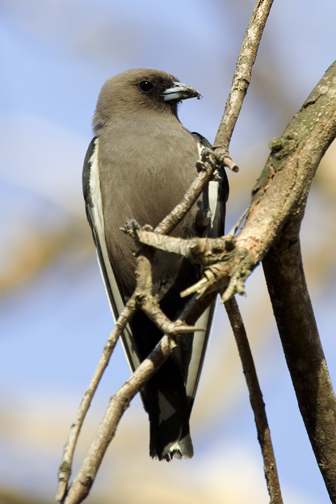 Only breeding males (below) have the white patch in their wings. 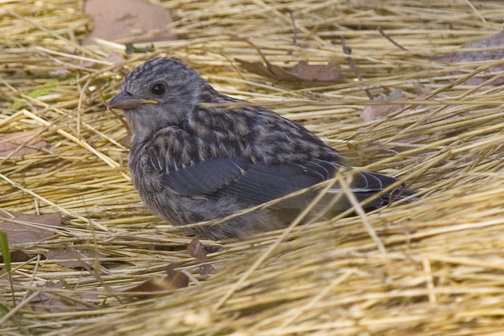 Females,and immature birds are largely brown. 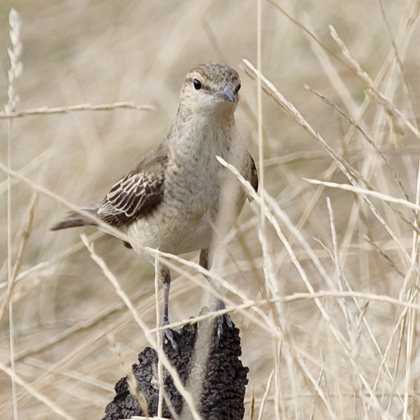 Males in eclipse plumage are similar in colouring to females, but darker on the wings and tail. These Trillers were photographed in the wooded area on top of a hill west of Jingellic. 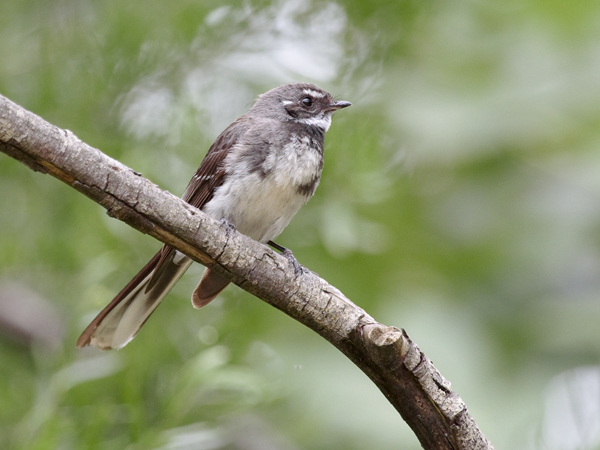 This Grey Fantail was active in willows by the Murray near our camp. 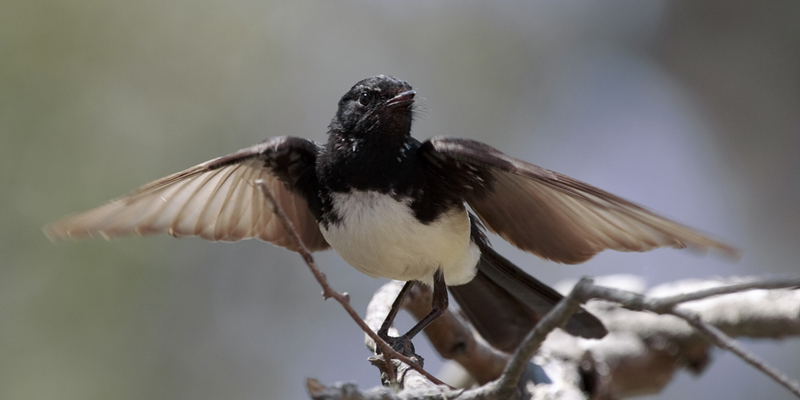 The above Willie Wagtail and its mate were caring for their three fledglings near our camp. 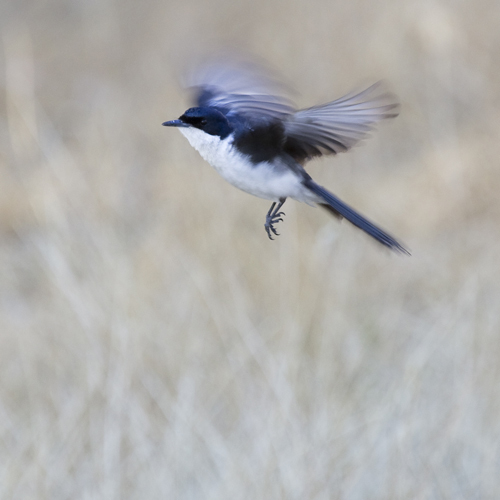 A Restless Flycatcher hovering over grass on the already-mentioned wooded hill west of Jingellic.